Every week, a lucky Bryant Park Corporation employee gets to explore The Holiday Shops at Bryant Park to give you a glimpse at what this year’s vendors have to offer. It’s finale week at The Shops, so Sarah set out to find great deals and post-holiday sales in the park. It’s your favorite word. It’s my favorite word. It’s everyone’s favorite word. Yes it’s after Christmas and that means one thing – discounts are everywhere. And The Holiday Shops are no exception. Unlike the other holiday markets around the city, our lovely shops remain open after Christmas (and New Year’s) until January 3rd, which means you have five more days to take advantage of the savings. Deals range from 25 to 50% off, with many BOGO (buy one, get one free) offers. 1. There are only 361 days until Christmas. Christmas ornaments and cards are deeply discounted. (Half-priced!) You’ll need them again next year, so why not buy them now? Then next year you can gleefully gloat to your friends and family that you were so organized and thrifty. 2. Your winter wardrobe will soon feel boring. We all go through the winter doldrums with clothing, especially us women. By late January, that black turtleneck seems rather boring and unthinkable to wear again. Luckily The Holiday Shops have great options for cool, funky accessories that can change an outfit without spending much cash. Plus, statement necklaces work during all four seasons, making them an especially shrewd purchase. 3. Your holiday gifts did not quite hit the spot. Exchanging gifts can sometimes be disappointing. We all have that relative who just slightly misinterprets our style. This situation is easily rectifiable. Swing by The Holiday Shops and treat yourself to something that you will actually like and use. Sitting on the Upper Terrace near the Holiday Tree, Cala Design has wonderfully colorful bags and wallets handmade in India. This is Cala Design’s fifth year at Bryant Park, with designs made especially for The Holiday Shops resulting in a very loyal and enthusiastic following. All of the vibrant creations are designed in New York and then handcrafted in India. And don’t miss the very pretty handcrafted paper necklaces ($22) made by a Ugandan women’s cooperative who have children in the Little Light Children’s Center in one of the poorest areas of the capital city Kampala. Cala Design pays the women fair trade prices and donates 20% of the sales directly to the women. Bags are regularly priced from $28 to $48 and wallets range from $24 to $28. *Sale does not apply to necklaces. Santa NY is one of many Christmas shops offering big discounts on ornaments. 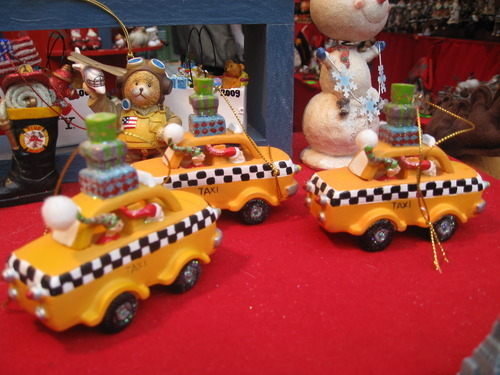 Located on the Fountain Terrace, stop and take a peek at the cute New York themed ornaments, especially the yellow taxi cabs. Now is the perfect time to take stock of your ornament collection and plug in the wholes for next year. Ornaments are now 50% off at Santa NY with similar deals throughout The Holiday Shops. Just off the steps at 6th Avenue and 41st Streets, Exotic Handmade Jewelry is the perfect place to pick up a piece of statement jewelry. The bold and chunky pieces are made from natural tree resin mixed with amber. These are the types of necklaces and bracelets that add a ‘wow’ to a plain white blouse and are sure to garner the much sought-after question: ‘where’d you get that?’ And it won’t cost a lot of money for a real one-of-a-kind addition to your accessory wardrobe. Necklaces normally $55 to $85, now feature a 30% discount. Now get out and shop, then spread the wealth and share your finds with the rest of us. 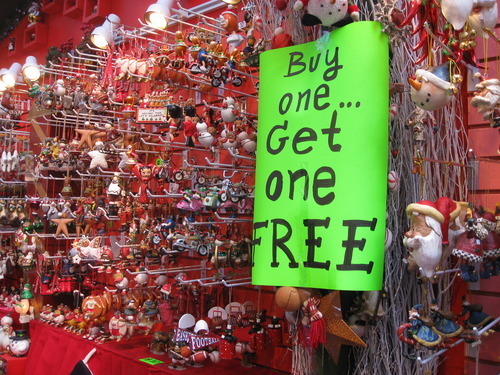 What deals have you found at The Holiday Shops? They are beautiful bags! Cala Design does not have a website, but we can probably help to get you in touch with the vendor. Please email bpshops@upsilonventures.com with the subject line "Cala Design".